Welcome to Contact Lenses Express, one of the UK's leading online contact lens retailers. We aim to provide our customers high quality contact lenses at low prices backed up with an exceptional level of service and quick delivery. We supply daily, monthly and two weekly disposable lenses from all major manufacturers like Johnson and Johnson, Coopervision, Bausch & Lomb and Ciba Vision. We also offer some of the cheapest contacts of Optician own brands, which are basically branded lenses which have been re-packaged as an optician own brand. Our business has been serving contact lens wearers for over 10 years, so you can choose the best disposable lenses and order your contacts online with us in confidence. We'll deliver you your contact lenses at up to 70% cheaper than high street prices. We hold over 1 million Daily and Monthly disposable lenses of all brands like Acuvue, Air Optix, Avaira, Biofinity, Biomedics, Focus, Frequency, FreshLook, Proclear, PureVision and SofLens in stock and can ship 98% of our orders on the same day. Our easy, simple and on the move re-ordering facility via mobile allows you to re-order your contact lenses in just a few clicks and from anywhere. We'll even send you a re-order reminder when you're due with great discount offers. 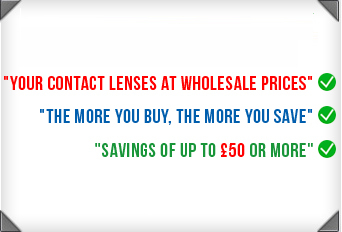 Get great quality, genuine lenses without paying High Street Prices. Get fast shipping with a range of delivery options. Enjoy bigger discounts when you purchase larger quantities. Re-Order your lenses in just a few clicks and make any changes within your account. We'll even send you a reminder when we think you'll be running low on lenses. You can purchase anywhere at any time using our mobile and tablet friendly site making it easier to order on any device. We offer our customers a 24/7 support facility. Contact us at any time via phone, email or live chat. We stock lenses from all the major brands and manufacturers. We Offer Daily Disposables, Monthly or Two weekly contact lenses and a wide range of coloured lenses. Your payments are secured by Secure Trading, using the latest encryption technology to make sure your details are safe and secure. If you have any questions, just give a call on Free Phone 0800 037 4000, email us at cs@cleuk.com or just click the Live Help button at the top of the screen to chat online. Introduce your friends and family to Contact Lenses Express and we’ll reward you with £5 off your next contact lens order.